A heat shock protein (HSP) is a one of group of proteins which increase their expression when the cells which contain them are exposed to high temperatures or other stresses. A large number of proteins in this group share the function of helping other proteins to fold or unfold. They are found in almost all living organisms, from bacteria to humans. Sometimes are they are also called chaperone proteins, since the “help” in protein folding, intracellular trafficking of proteins, and coping with proteins denatured by heat and other stresses. Heat-shock proteins also occur under non-stressful conditions, simply “monitoring” the cell’s proteins. Some examples of their role as “monitors” are that they carry old proteins to the cell’s “recycling bin” (proteasome) and they help newly synthesised proteins fold properly. These activities are part of a cell’s own repair system, called the “cellular stress response” or the “heat-shock response”. Do you want to live longer and stay stronger? Now scientists had been discovered a protein which was called HSP 10 (heat shock protein) can prevent the degeneration of muscle caused by the aging process. (Kayani, A, et al., 2010) It was a study conducted by McArdle and his colleagues. They tested on adult wild type mice found that the overexpression of HSPs was successfully inhibited the loss of muscle strength compared to the control mice. After that, the researchers at Liverpool, incorporation with colleagues at the University of California, also found that the excessive of HSP10 was inside the mitochondria can preserve muscle strength and stopped the body aging process. As in the age range between 50 and 70, there would be about 25-30% of muscle loss in our body. (Kayani, A, et al. , 2010) Elderly people usually suffered problems which leaded to the result of serious injured and death especially when they fall down. It was due to the loss of mobility and weakened skeletal muscle. This is the main reason why the HSP 10 protein was studied intensively. Heat shock protein (HSP), from the name mentioned, its functions were related to the temperature. It was found in most of the organisms, including bacteria and human. Its expression in the cell improved once exposed to the higher temperature or other stresses. The regulation of the heat shock proteins was controlled by the heat shock response that induced by heat shock factor (HSF). (Wu C, 1995). 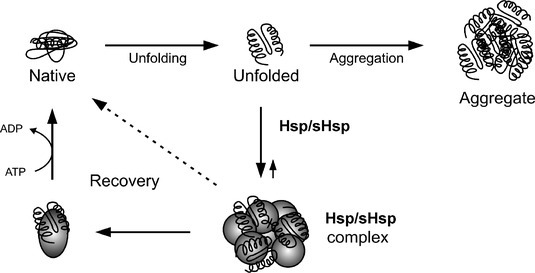 The constitutive overexpression of the Hsp was known to promote cell survival through inhibition of apoptosis. 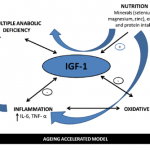 (Samali and Orrenius, 1998)This protein helped to monitor and organise protein interactions within the body and responds to environmental stresses, especially exercise and infection. (Kayani, A, et al., 2010) Besides that, HSP 10 helped to stabilize the partially unfolded proteins and transported proteins across the membrane. Some heat shock proteins also transport the old proteins to the proteasome forproteolysis. There was also some HSP found in the extracellular membrane which functioned to bind with the antigen and relayed signals to the immune system. For your information, the HSP 10 was a homologue of co-chaperonin GroES in the mitochondria. (Hohfeld j, HartI FU, 1994) It participated in various aspects of HSP 60 functions. The scientists believed that the heat shock protein, HSP 10 had the protective ability against the age-related protein carbonyls – plasma markers of oxidation. 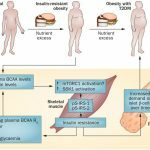 They were purposely studied the protein function to be later used in the elderly cells as the skeletal muscle becomes smaller, weaker, and more susceptible to stress damage. They provided conditions which induced the production of HSPs such as infection, inflammation, exposure to toxins (such as ethanol, arsenic UV light, trace metals), starvation, hypoxia or oxygen deprivation, nitrogen deficiency in plants, water deprivation, increased in damage or presence of abnormal proteins, and exercise. (Santoro MG, January 2000) They found that the HSPs production increased after exercise was beneficial for muscle recovery. (McArdle A et al., Feb, 2002) The prooxidants triggered skeletal muscles to boost the body’s synthesis of antioxidant enzymes and HSPs. It helped the cells to resist damage and recover more effectively.